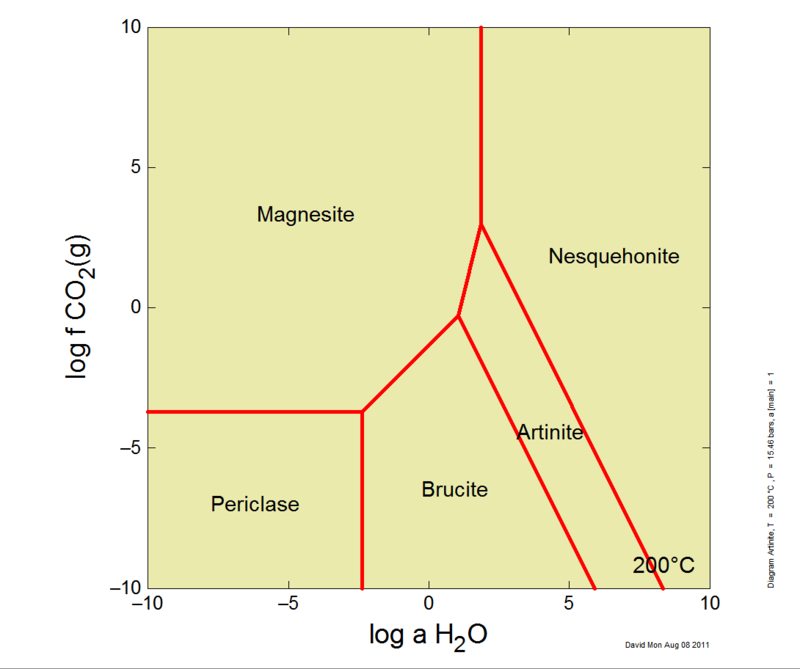 I am interested in understanding magnesium mineral species equilibrium at high temperatures in the presence of (and as a function of) CO2 and water. At these conditions, the co2 and water are both present in the gas phase. Whilst the co2 data is given as fugacity, the water is given in terms of activity even though it is in the vapor phase at my reaction conditions, ie steam. How can i convert/relate this water activity to a water fugacity of partial pressure? GWB calculates water vapor fugacity as well- you can see this under the 'gas fugacities' section in the text output, or under the Gtplot plotting variables. Specifically, I am trying to plot phase diagrams using Act2 where all my phases are solid minerals in the presence of Co2 and water gases. The output file does not seem to specify whether the water data is activity or fugacity. However, the output plot has water activity on the x axis. When i generate similar phase diagrams manually, they are somewhat comparable to Act2 results other than the fugacity/activity issue. I hope I am not being too confusing. Still not exactly sure what you are trying to do [remainder of this post deleted, follow up with response below]. I really appreciate your help. I have attached an output example of the type of diagram i am trying to generate. My problem is that the x-axis is specified as water activity and I cannot seem to change it to fugacity although it should be fugacity since at the given conditions (200C, 1bar) water is in the gas phase. Basically, my question is what does this water activity in the gas phase mean? is it the same as water fugacity? Water activity is the activity of the water phase, it is not the same thing as water vapor fugacity. Would you mind attaching a saved copy of your script so I can take a look at it? I understand the water activity is not the same as the fugacity. My problem is that I have never heard of a water "activity" when in the gas and I am trying to understand what it means physically in terms of something such as pressure or fugacity which are more prevalent for reporting gas phase data. I have attached the Act2 file output. I uploaded the incorrect file (only difference is system pressure). Act2 using its default thermo databases can generate diagrams up to 300 C, at pressures of 1 atm up to 100 C, and following the steam saturation curve thereafter. Above 100 C, then, water is still liquid, unless you specify a lower pressure (which you did in your last diagram). The effect of pressure in Act2 influences only the position of water stability limits and the stability of gas phases. Your diagram is entirely composed of minerals, however, so keeping the pressure at 1 bar doesn't really do anything. I also wonder how useful the x-axis you have chosen is - it seems to be more of a mathematical abstraction than a chemical reality. From my understanding water activity should vary from 0 to 1, so it seems Magnesite and Brucite would be the only likely phases. This isn't exactly answering your original question but you might try a different sort of diagram (diagram Mg++ in Tact vs T and f CO2, or in Act2 vs f CO2 and pH or activity Mg++). You can set an activity for water or a pH in any of these diagrams. Hope to have helped. Is it possible to model water in the gas phase (ie steam) or is water always modeled as a liquid in the GWB software? Can water pressure or fugacity be used as a variable in GWB calculations? To the best of my knowledge water is generally modeled in the liquid phase. In Act2 or Tact, for instance, the activity of water (which is close to 1 in dilute solutions and decreases with increasing ionic strength) can be used as a constraint. In SpecE8 or React, (which perform speciation and reaction path calculations, respectively) water activity is calculated based on the ionic strength and temperature of your system. The fugacity of steam (water vapor) is also calculated and appears in the output results. This fugacity represents the partial pressure of an external gas buffer (large reservoir) in equilibrium with your fluid, if such a gas phase were to exist. The fugacity of steam cannot be set as a constraint.